From the slam and squeak of a screen door to the scent of berry pie wafting from its windowsill cooling spot, summer in the kitchen can stir up cravings for times gone by (or at least their style). Whether you pine for the kitchen of your childhood home or want to help your period home look its best, these 11 additions — from big changes to minor tweaks — can help achieve the look you want. 1. 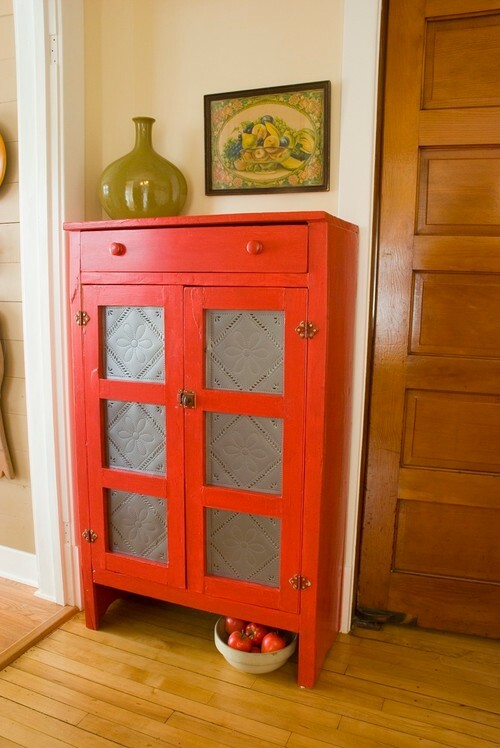 Screened pantry door. Replacing a solid pantry door with a screened version is a relatively simple change that can boost your kitchen’s vintage style. And, of course, if you have a door leading outside from your kitchen, adding a screen door for the summer months is always a welcome touch. 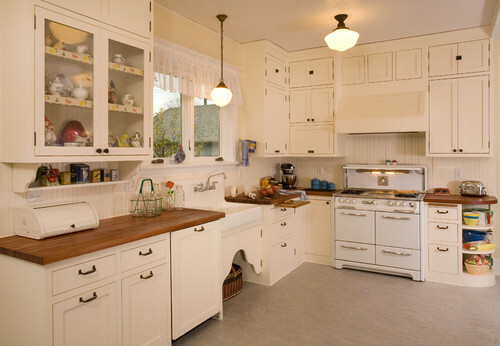 Is your kitchen a good candidate for a vintage-style makeover? If you have a cottage, farmhouse or any home built from the 1920s to the 1950s, most of the vintage-style additions mentioned here should work well; a home that is much older or newer might not take as well to vintage style. Still, if it’s a look you love, don’t be afraid to sneak in a few fun accessories, no matter the age or style of your home. 2. Period lighting and details. It’s easier than ever to find period-accurate lighting and hardware (try Rejuvenation or search the Houzz Shop for starters), and these details can make a big difference in the look and feel of your kitchen. 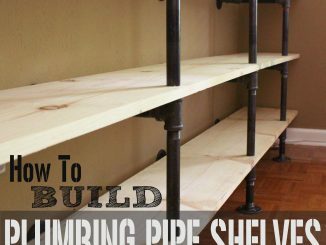 If you know the year your home was built, track down lighting and cabinet pulls in the style that would have been used at that time (1920s or 1930s, for instance) for a vintage makeover. 3. Refurbished vintage range. Some cooks swear by the heft and power of vintage stoves — and with companies refurbishing them to work in modern kitchens, you can have a vintage range that doesn’t just look the part but works well too. 4. Retro appliances. 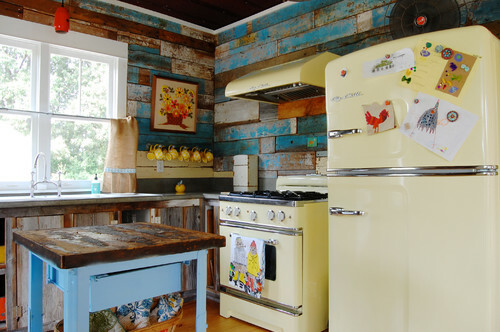 Another option is to go with new appliances designed with a vintage look. 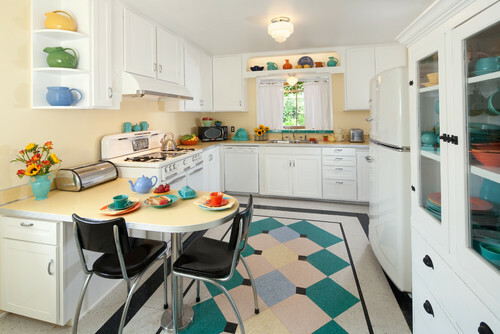 Companies like Big Chill (whose products are seen here) turn out refrigerators, stoves and more that fit with a retro aesthetic and come with Energy Star ratings. Retro or vintage: What’s the difference? These terms tend to be used interchangeably, but more often retro refers to 1940s and 1950s style, while vintage can stretch back to the 1920s. 5. Beadboard. 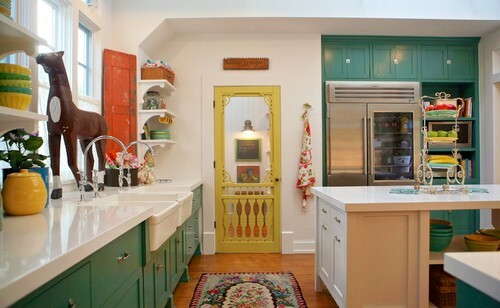 For a kitchen that channels vintage farmhouse or cottage style, beaded board is a great way to instantly boost charm. 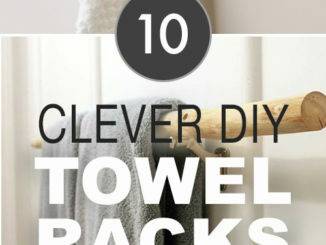 Use it as a backsplash, on the base of an island or to cover entire walls. Painted crisp white, buttercream or mint green, beadboard can bring some soul to even the plainest white box of a kitchen. 6. Farmhouse sink. A fireclay or porcelain apron-front farmhouse sink with a gooseneck faucet works in any vintage-style kitchen, but it’s more at home in older houses and farmhouses rather than in midcentury ranches. 7. Pie safe. This onetime fixture in kitchens is a wooden cabinet fitted with screen or punched-tin fronts to let the air flow in but keep the bugs out. It still makes a respectable place to cool a pie, but it can also be put to work housing stacks of dishes or pantry goods. 8. Vintage linens. 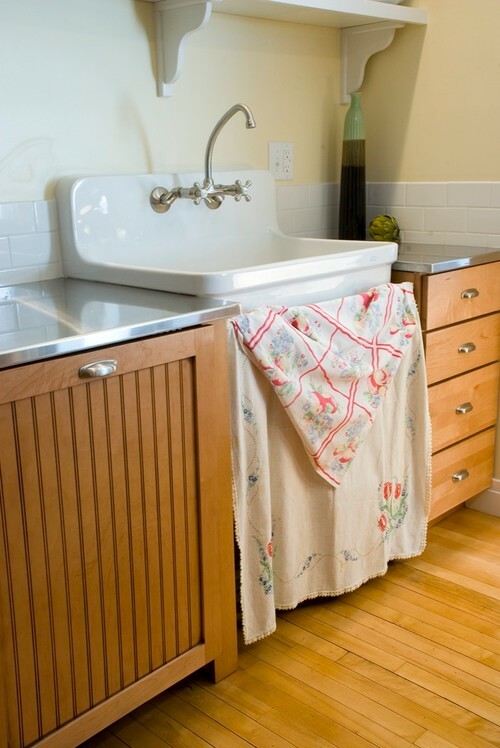 Whether used as a skirt for a sink or used as intended — for wiping up spills and drying dishes — vintage linens can always find a place in the kitchen. A stack of colorful vintage tea towels is a great way to add a hint of vintage style if the rest of your kitchen is modern and sleek. 9. Plate rack. 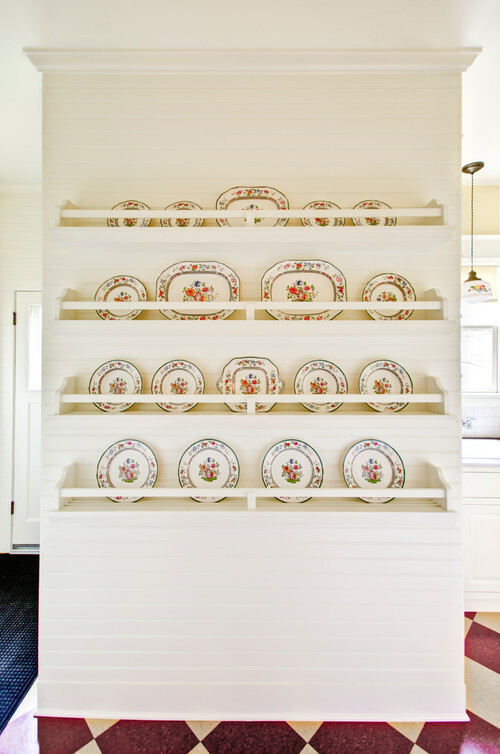 A plate rack — either the shelf type shown here or the sort where plates are stored in vertical slots — is both decorative and handy. Keep your best dishes on display or your everyday favorites within easy reach of the table. 10. Diner-style counters and floors. Budget-friendly and hard-wearing, laminate counters with curvy aluminum edging were a staple in 1950s diners and home kitchens alike. These counters — along with checkerboard linoleum floors — were most common from the 1930s to 1950s. 11. Fiestaware. The vibrant colors of Fiesta dishware look cheerful and bright behind the doors of glass-front cabinets or lined up on open shelves. Fiesta, which peaked in popularity midcentury, is still being produced today.